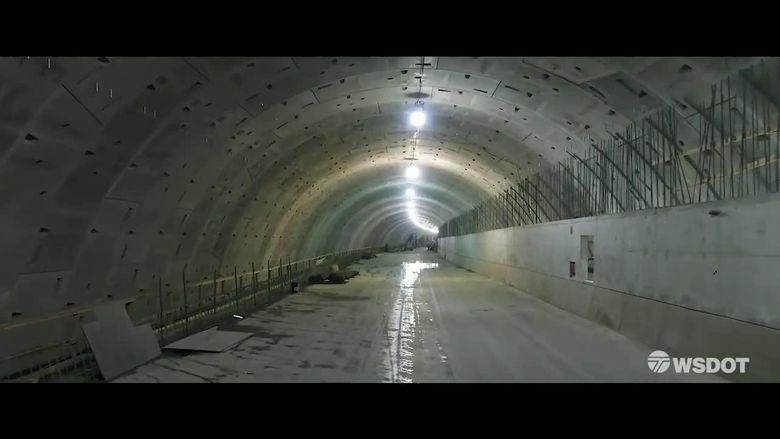 Workers have completed 85 percent of the tunnel's upper deck, which can be seen in the video. The 1.7-mile tunnel bypassing downtown Seattle is expected to open for traffic in early 2019. The gray walls and decks of the future Highway 99 tunnel are on display through a new two-minute drone tour, published Friday morning by the Washington State Department of Transportation. Seattle Tunnel Partners has completed 85 percent of the upper deck, which will carry two lanes of southbound traffic. That’s opposite from the old Alaskan Way Viaduct, where the upper deck carries northbound vehicles. In November, local building-trades workers will start to assemble the tunnel’s lower, northbound deck, made from precast concrete slabs built in Tacoma. This drone footage provided by the Washington State Department of Transportation shows the entire length of the Highway 99 tunnel and its current state of construction. The 1.7-mile tunnel bypassing downtown Seattle is expected to open for traffic in early 2019, followed by demolition of the viaduct. The tunnel will eventually be tolled at a yet-undetermined rate. Drone video fails to fully convey the vastness of the 57-foot diameter tube, the largest-ever single bore in North America. But WSDOT supplemented the footage with pointer diagrams, showing the tunnel floor measures 38 feet across, and some huge square openings where vehicle or fire exhaust will be sucked out for ventilation. Another highlight is the closing overhead shot in Sodo, where the launch pit for the tunnel-boring machine Bertha has been covered by a concrete lid. Final costs for the $2.1 billion tunnel remain under litigation, as contractors seek another half-billion dollars for overruns and delays, from the state or insurers. 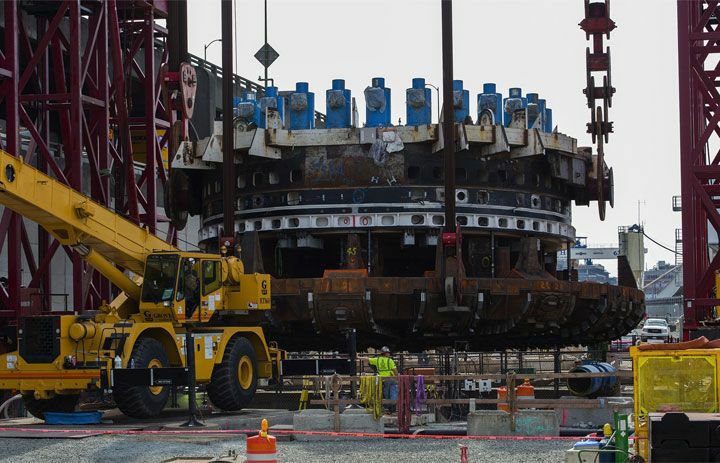 Bertha finished the dig this April, after being stranded two years for repairs and improvements.